The big one that has just been unleashed is the brand new full-length album from the head of Hyperdub himself – Kode9 & The Spaceape’s Black Sun. A lot has changed in bass music since their first collaborative album dropped back in 2006, but Kode9 is still hailed as a visionary leader of the movement. The album holds all the ominous might and menace you’d expect from this pair but the beats are teased out in slightly different directions. The collaboration with Flying Lotus is as killer as it should be. Another Hyperdub legend recently gave a rare treat – new music from the elusive and iconic Burial. The three-track EP Street Halo holds its own after an agonizing four year wait for fans on any new solo material from his hallowed studio. It comes straight off the back of his stunning collaboration with Radiohead’s Thom Yorke and Four Tet. Speaking of Radiohead, there are very serious rumours of a remix project of tracks from their incredible The King of Limbs album. Thom Yorke has made no secret of his love affair with the new vanguard of bass producers having previously collaborated with Flying Lotus and recently spinning a surprise DJ set at Gaslamp Killer’s night Low End Theory. Names being mentioned as possible remixers for Radiohead include bass wizards Mark Pritchard and Illum Sphere. Watch this space for more news on this exciting project. Other amazing albums with a drum’n’bass slant that are shaking up the detritus right now include the eagerly anticipated Instra:mental album Resolution 653 on Nonplus and d’n’b-heads-turned-steppers Kryptic Minds with their third album Can’t Sleep. Dutch producer 2562 has also lifted the lid on his third full-length Fever which heads in a decidedly more housey direction. The king of them all right now for this bass head though has to be the brand new album from Mr. Amon Tobin. 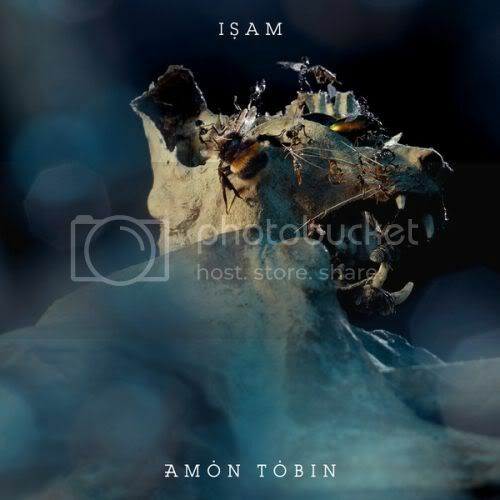 Entitled Isam, this record builds on the dense compositions, moody sound design and disorientating rhythms of 2007’s Foley Room with a more urgent and harsh electronic edge to it. Head to his website here for a free download from this amazing record and details of an incredible art installation to celebrate it’s launch. Also, be sure to check a full track-by-track commentary of the album by the man himself on his Soundcloud. It’s a good time to be alive! Dank Morass presents THE GASLAMP KILLER, at Step Inn, Saturday 6 March, 2010. Tickets on sale now from OzTix, Rockinghorse Records (online and instore), Butter Beats (Brisbane city and Valley stores) and all OzTix outlets. 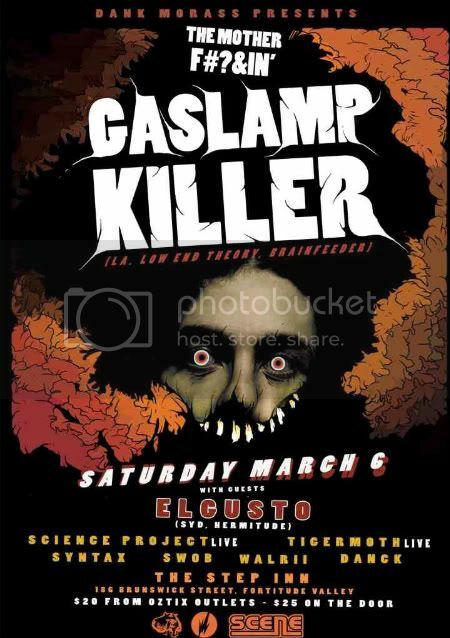 Dank Morass is excited to present the debut Brisbane show for the hottest DJ in the world of beats and bass – The Gaslamp Killer. A founder of LA’s acclaimed weekly Low End Theory club, the GLK’s lateral crate-digging through dusty psychedelia, classic hip hop, cutting edge beats and heavy dubstep is unparalleled. With the spirit of the West Coast psychedelic movement of the 60s and the current manifestation of the beat generation running strong in his blood, the GLK will lay waste to the main room of the Step Inn on Saturday March 6. Moving between San Diego, San Francisco and Los Angeles, The Gaslamp Killer made a name worldwide with mind-boggling mixes such as I Spit On Your Grave and Hell And The Lake of Fire are Waiting For You. Closely affiliated with Flying Lotus’ Brainfeeder collective, he released a debut EP, My Troubled Mind on that label in 2009. A whirlwind of rumbling bass and psych-rock edits, the EP is just one weapon in the GLK’s diverse arsenal of bass. Low End Theory, which The GLK curates with fellow residents Daddy Kev, D-Styles and Nobody, has been hailed as the international headquarters for raw and soulful hip hop, psychedelic beats, glitch-hop, avant-rap, IDM and dubstep. The Gaslamp Killer is absolutely at the forefront of the thrilling collision of these disparate but complementary sounds. In support, the Morass presents a rare Brisbane DJ set for Elgusto. One half of premier Australian beats duo Hermitude and producer for Herd-frontman Urthboy, Gusto has played leading bass nights Void and Headroom in his adopted hometown of Sydney. Favourites of Japan’s legendary DJ Krush, Hermitude have dropped three albums of world-class beats on the Elefant Traks label, most recently the sublimely composed Threads. Nomadic Brisbanite Tigermoth will perform tracks off his haunting solo debut Underwater Beats and preview music from a new album. Equally influenced by US and Japanese hip-hop, Tigermoth weaves an abstract, instrumental soundscape backed by orchestrated beats in a mix evocative of Tokyo’s industrial landscape and Australia’s natural milieu. Rounding out this top shelf line-up is local live dubstep duo Science Project, who have been toiling away in the lab for months, concocting unhurried heaters that are brought to life with drum kit and MPC on stage, and Syntax, playing original bass heavy hip hop beats. Additional atmospherics will be provided by the Dank Morass DJs Walrii, Swob and Danck. The Morass has been DJing and promoting beats in Brisbane since late 2007, and has previously hosted Flying Lotus, Starkey, The Bug, Joker, Coki & Loefah and Blu & Exile. Cost: $20+bf presold from OzTix.com.au, Rockinghorse & all OzTix outlets, $25 on the door.